Have You Ever Been to a Film Revival? 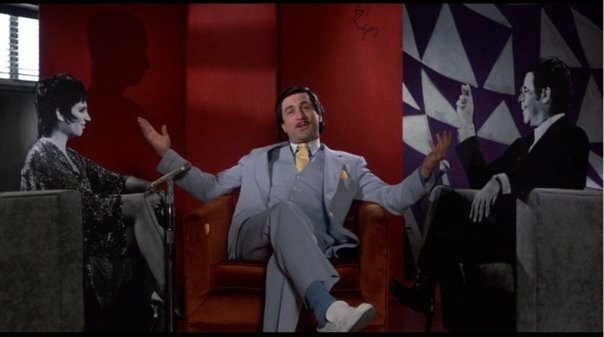 Every year I attend the Tribeca Film Festival and for 2013, the film festival will close with a new restoration of Martin Scorsese’s The King of Comedy. Despite that Scorsese is one of my all-time favorite directors, I haven’t seen the film before and I’m attempting to buy tickets for the screening. This brings me today’s question: have you ever been to a film revival? There are quite a few I’ve attempted to see but ended up missing (I missed when both Pulp Fiction and Reservoir Dogs briefly came back into theaters as well as Jaws). But have you gone to any? Depends what you mean by revival… I often go to see older/classic films at the cinema. The last one was properly epic… they’ve recently remastered Lawrence of Arabia and it ran for a month at the BFI in London at the start of the year – one of the best cinema experiences I’ve had for years. But I’ve also seen 2001, The Shining, Dr Strangelove, Aliens and Goodfellas in the last few years. There’s nothing like seeing a great movie on the big screen. I would love to see those films in theaters. Any Kubrick movie would be great to watch on the big screen. Thanks for commenting. I haven’t been to any, but I would certainly like to sometime in the future. I don’t think I’ve been to any either, but I hope to see some later this year. Thanks for commenting. I saw Vertigo, Rear Window and The Trouble With Harry when they were revived in the ’80s. Seeing Rear Window and Vertigo in theaters sounds great. I’m a huge Hitchcock fan and I would have loved to watch them on the big screen. Thanks for commenting. I never have, but I’m hoping to go to some this summer. I don’t think I have either, though I know a few theaters which sometimes play classics. I hope to go to one soon. Thanks for commenting. The Stanford Theatre (http://www.stanfordtheatre.org/) in Palo Alto shows classic films from Hollywood’s golden age. Not only do they show incredible films, but the theater itself is a historic landmark that originally opened in 1925!! I’ve seen several films there over the years, the last one being Breakfast at Tiffany’s. They’re currently showing an Alfred Hitchcock film festival. If you’re ever in the Bay Area, I highly recommend checking this place out. I know a theater like that. That sounds great and I would love to go there. Thanks for commenting. I’m really excited to see it. I’m a huge Scorsese and DeNiro fan, and I’ve always wanted to watch this film. Thanks for commenting. It was a long time ago, but I saw a remastering (or perhaps recoloring) of Orson Welles’ Touch of Evil (1958) at the Esquire located in the Cincinnati area. Chuck Heston as a Mexican narcotics officer lol. Still it was a Welles movie so well worth going to see. It is more enjoyable paying money to see a good re-release than a new release of a crappy movie. Touch of Evil would be great to see in theaters, though too bad it was a colorized version. Welles was a great filmmaker, it’s upsetting to see how bad his films were treated by Hollywood. Thanks for commenting. I love catching classics in the theater. My biggest highlight was seeing 2001: A Space Odyssey in 70mm. It was unreal. 2001 would be great to see, especially in 70 mm. Stanley Kubrick’s movies all must be fantastic to watch in theaters. Thanks for commenting. Jaws and Psycho – both were fantastic in the cinema! I would love to see both in theaters. A film revival is when a theater shows an old film back on the big screen. I don’t think I’ve been to one though I’ve tried to go to a few. Oooh I see, d’oh!! Ok then I have been to a couple, Casablanca and Singin’ in the Rain. I wish I had been to the Lawrence of Arabia one when they re-released it last October!! Watching Casablanca and Singing in the Rain in theaters would be great. I missed Lawrence of Arabia’s revival as well, which I really regret. The Gospel According to St. Matthew was playing yesterday. That was great. Also, I’m going to France with some friends this summer and I’m booking myself a ticket to see Playtime in 70mm… That will be unreal; not only is it my favourite film, but it is also one of the few that needs to be seen on a big screen, purely because so much is going on in each shot. I haven’t seen either film, but both sound great to see in theaters. That sounds like a great trip, one of my friends actually once went to an art house theater in Paris playing a Martin Scorsese marathon. I’ve never been to one but love the King of Comedy and would like to go. Great site by the way, I am now following. I just started my own film blog and would appreciate it if you checked it out. Hopefully you’ll like what you see. I think I’ve been to two total film revivals, and that’s really good, considering that where I live, there’s no arthouse cinemas or any other theaters that bring us the movies we want at any time of the year. Last year, I saw a special engagement of Casablanca in theaters for its 70th anniversary. Considering it was a Wednesday, and it was state testing week, I feel so lucky to have gone and seen it, and I instantly fell in love with it (I hadn’t seen it prior to then, and I need to watch it again). I also went to see Titanic in 3-D with two of my friends when it hit theaters again in early April. I think I’d seen the movie at least three times before then (because I love James Cameron, and it’s just a great movie), but it blew my mind in theaters. It felt so lifelike. Hope you enjoy seeing The King of Comedy again at a film festival. I love that movie. One of Martin Scorsese’s most underrated classics. I’d love to see Casablanca in theaters. I’ve been putting off The King of Comedy too long and am excited to see it. Thanks for commenting.